Department of Dosage Form Design, Faculty of Pharmacy, MAHSA University, Selangor, Malaysia. ABSTRACT: The purpose of the research was to develop and evaluate metronidazole loaded HPMC K15M mucoadhesive microcapsules for sustained drug release at the gastric mucosa. Metronidazole mucoadhesive microcapsules were formulated by ion gelation technique using 32 factorial designs. A 32 full factorial designs were used to derive a statistical equation, ANOVA analysis, contour plots, and 3D response surface plots. Different polymer ratios of HPMC K15M and sodium alginate were used to formulate nine formulations (F1 to F9) of HPMC K15M loaded mucoadhesive microcapsules of metronidazole. In-vitro drug release and mucoadhesion were carried out by USP29 type-II tablet dissolution test apparatus and disintegration tester using goat stomach mucosa. The formulation was characterized by determining possible drug-polymer interaction using FT- IR, the percentage of yield, particle size, the percentage of entrapment efficiency, swelling index, the percentage of mucoadhesion and percentage of drug release. FT-IR spectroscopy result shows the interaction between the drug and polymers combined. The optimized formulations F9 exhibited high drug entrapment efficiency of 92.07 ± 0.02%, particle size of 852.46 ± 0.04 (μm), percentage yield of 96.36 ± 0.04%, swelling index of 99.25 ± 0.02%, percentage of mucoadhesion after 8 h was 69.00 ± 0.04%, and the drug release (49.70 ± 0.01%) sustained more than 14 h. Metronidazole mucoadhesive microcapsules adhered more strongly to gastric mucous layer and could retain in the gastric mucosa for an extended period, followed by a non-Fickian type of release. The study shows that metronidazole mucoadhesive microcapsules can be effectively used for sustained drug release to the gastric mucosa in the treatment of H. pylori infection. INTRODUCTION: Metronidazole [1-(2-hydroxyethyl)-2-methyl-5- nitroimidazole) is a broad spectrum antimicrobial agent. It is used in the eradication of Helicobacter pylori Infections which is responsible for developing gastritis, gastric ulcer and gastric carcinoma 1, 2. Due to the short biological half-life (6-8 h), short gastric residence time and non-targeted drug release, and bitter taste which may lead to compliance issues 3-5. H. pylori are a motile pathogen which lives in the gastric mucus layer and penetrates deep in the mucous membrane close to the epithelial cells 6. The eradication of H. pylori infection is the main troubles antibiotic resistance, patient’s compliance and intolerance to therapeutic regimens 7, 8, 9. The causes of resistance are poor drug penetration, low drug concentration; short gastric residence time and antibiotic resistance represent a significant health care burden on society. Besides, the poor stability of antibiotics in gastric content requires frequent administration and leads to patient noncompliance 10. Mucoadhesive drug delivery systems (micro-capsules) have developed to raise the contact time or residence time with mucous layer and absorption tissue of the dosage forms thereby resulting improving drug absorption, increase bioavailability and also work in sustained release of drugs which are influenced to reduce the gastric motility time and diminish peak plasma fluctuations 11, 12. Dosage forms are designed by mucoadhesive polymers that drugs are achieved prolong retention time at the site of action, controlling and extending drug release over extended period time result in increasing bioavailability, improve patients compliance and better therapeutic effects 13, 14. Hence, the mucoadhesive drug delivery systems can enhance the efficiency of the drug for H. pylori infection treatment. Alginate is nature polymer which is obtained from marine brown algae. It exhibits mucoadhesion, biocompatibility, biodegradability, ability to form gels in the presence of ca2+ and more used in pharmaceutical preparations for controlled drug delivery system 15, 16, 17. The medicinal use of sodium alginate which is achieved to sustained and controlled release drug delivery due to its hydrogel-forming properties 18. Alginate mucoadhesive microcapsules are the re-swelling ability and drug release rate retardant a period of long time 19. Microencapsulation is a method (ion gelation technique) by which an active ingredient is entrapped inside a miniature capsule. Very tiny droplets, or particles of liquid or solid material, are surrounded within a second material or coated with a thin film of polymeric material to protect the active ingredient from the surrounding environment. These enclosed capsules, which range in size from a micrometer (diameter range of 1 to 1000 μm) to a millimeter, are referred to as microcapsules 20, 21. Microencapsulation (microcapsules) are capable drug carrier particle, control the release rate or target the active drugs to a specific body absorption site for particulate drug delivery system, thereby it is enhanced drug absorption, reduced toxicity, superior patient compliance and convenience 22. Therefore, the development of new controlled or sustained release of the drug delivery system is one of the most excellent fields of research in the pharmaceutical sciences which deliver the drug to the target tissue in the body. As a result, it has overcome difficult problems of conventional therapy such as drug toxicity, stomach irritation, resulting in enhanced the therapeutic efficacy of an administered drug and reduced toxicity 23. The ion gelation technique was used to prepare sustained release metronidazole loaded HPMC K15M mucoadhesive microcapsules. The influence of different formulation factors on the particle size, percentage yield, drug entrapment efficiency, swelling index, mucoadhesion, drug release mechanism, and in-vitro drug release was investigated. The present work was aimed at reducing the dosing frequency, improving oral bioavailability and sustained release an extended period of metronidazole mucoadhesive microcapsules for effective treatment of H. pylori infection. Materials: Metronidazole was purchased from Sigma-Aldrich Company, Germany. Sodium alginate, carbopol 934P, and calcium chloride were obtained as a gift sample from MAHSA University, Malaysia. Methods: Formulation of metronidazole mucoadhesive microcapsules was formulated by using ion gelation technique 24. Sodium alginate-HPMC K15M as mucoadhesive polymers were dissolved in 10 ml purified water to form a homogeneous polymer solution. The metronidazole active ingredients were added to the polymeric solution and mixed thoroughly with a stirrer to form a viscous dispersion. The resulting dispersion solution was added manually dropwise into 10% w/v calcium chloride solution (40 ml) through a syringe (no. 21). The added droplets were retained in the calcium chloride solution for 1 h to complete the curing reaction and to produce spherical rigid mucoadhesive microcapsules. The mucoadhesive microcapsules were collected by decantation, and the products were separately washed frequently and dried at 40 °C for the 3 h in a hot air oven. Various formulations of metronidazole-carbopol 934P mucoadhesive microcapsules were prepared individually by using all combinations of different levels of experimental variables as shown in Table 1. Particle Size Measurement: Metronidazole mucoadhesive microcapsules of particle size were evaluated by using optical microscopy method. The amount was done under 10 × 45 (10x eyepiece and 45x objective) and 100 mucoadhesive micro-capsules counted for particle size analysis by using a calibrated optical microscope. First of all, 100 mucoadhesive microcapsules were taken and kept in a glass slide. It was mixed with glycerin and set in an optical microscope, then determined the particle size 27. Percentage Yield: Percentage yield of metronidazole mucoadhesive microcapsules was calculated to know the efficiency of the methods used during the preparation, which might be useful in the selection of an appropriate method for future production. Percentage yield was calculated as the weight of mucoadhesive microcapsules recovered from each formulation about the sum of starting material. The percentage yield of prepared mucoadhesive microcapsules was determined by using the formula, respectively 28, 29. Drug Entrapment Efficiency: 100 mg of metronidazole mucoadhesive microcapsule was crushed individually in a glass mortar and pestle, and the powdered microcapsule was suspended in 10 ml of phosphate buffer solution (pH 7.4), respectively. After 24 h, the solution filtered and the filtrate was analyzed for the drug entrapment efficiency after it was calculated using the following formula 24. Swelling Index: The metronidazole mucoadhesive microcapsule (100 mg) was placed separately, in a glass vial containing 10 ml of 0.1N HCl at 37 ± 0.5 ºC in an incubator with occasional shaking. The swelled metronidazole mucoadhesive micro-capsules were removed a predetermined time interval and weighed after drying the surface by using tissue paper. The weight of the swollen microcapsules was recorded after a period of 8 h, and swelling ratio was calculated using the following formula. Whereas, Wt = Equilibrium weight of microcapsules after swelling and Wo = Initial weight of microcapsules 30, 31. Mucoadhesion Testing by in-vitro Wash-Off Test: The Mucoadhesive property of the metronidazole mucoadhesive microcapsule was evaluated by an in-vitro wash-off test using goat stomach mucosa. A piece of goat stomach mucosa (2 cm × 2 cm) was collected and tied onto a glass slide (7.5 cm × 2.5 cm) using thread. 100 metronidazole mucoadhesive microcapsules were separately placed onto wet tissue specimen, and the prepared slide was hung into the groove of disintegration tester. The tissue specimen was given a regularly up and down movement in a beaker containing 900 ml of 0.1N HCl (pH 1.2) separately at 37 ± 0.5 °C. At the end of the time interval, the number of mucoadhesive micro-capsules that remained attached to the tissue was recorded 32, 33. Where, Nn = Adhesion number, N = Number of mucoadhesive microcapsules attached to the mucosa after washing, N0 = Initial number of mucoadhesive microcapsules in the intestinal mucosa. In-vitro Dissolution Studies: Dissolution studies of metronidazole mucoadhesive microcapsule, equivalent to 250 mg of metronidazole individually was carried out by USP dissolution test apparatus (Electrolab India) at 50 rpm and 37 ± 0.5°C, using 900 ml of 0.1N HCl (pH 1.2) as the dissolution medium. An aliquot of sample (5 ml) was withdrawn periodically, replaced with an equivalent volume of dissolution medium. Samples, filtered through Whatman filter paper (0.45 μm), was analyzed spectrophotometrically at 277 nm. Drug release data obtained during in vitro dissolution studies were analyzed for release kinetics using zero order, first order, and Higuchi model equations and fitted into Korsmeyer-Peppas model for evaluation of release mechanism from mucoadhesive microcapsules 34, 35. Drug Release Kinetic Profile: To study the drug release kinetics and mechanism of metronidazole mucoadhesive microcapsule, the in-vitro data was evaluated to find a suitable mathematical model to fit the in-vitro release behavior. The following mathematical models evaluated to determine the drug release per unit time, namely zero order and first order whereas Higuchi and Korsmeyer-Peppas model was used to evaluate the mechanism of drug release 36. K0 = rate constant and concentration release is directly proportional to time. First Order: First order kinetic is described absorption and clearance of the drug. The release rate of the drug is dependent on concentration. Where, C = initial concentration of drugs and indicates first order reaction constant. Higuchi’s Model: Higuchi’s model determines the kinetic profile of different geometric and porous drug delivery system. It obeys Fick’s law and is square root time dependent. Where KH = Higuchi dissolution constant to identify the diffusion controlled process. Drug release that calculated in time per unit area is plotted against a square of time. Korsmeyer - Peppas Model: Determine drug release mechanism of particular dosage form either by fickian or non-fickian. Where Mt / M∞ = drug release at time t, n = exponent indicative of release mechanism manipulated by polymer and K = kinetic constant with structural and geometric properties of a dosage. 32 Full Factorial Design Studies: A statistical model incorporating interactive and polynomial terms was utilized to evaluate the responses. Where Y is the dependent variable, b0 is the arithmetic mean response of the nine runs and b1 is the estimated coefficient for the factor X1. The main effects (X1 and X2) represent the average result of changing one factor at a time from its low to high value. The polynomial terms (X12 and X22) are included to investigate non-linearity. On the basis of the preliminary trials a 32 full factorial design was employed to study the effect of independent variables, X1-concentration of sodium alginate (% w/v) and X2- concentration of polymer (% w/v) on dependent variables Particle size, % drug entrapment efficiency, swelling index, drug release, and percentage mucoadhesion. Factorial designs can screen for important drugs and drug interactions, as well as determine potential optimal drug dosages. Enable to build statistical models with a small number of runs. A statistical model was incorporating by using Design-Expert® Software Version 11.0.0 24, 36. Statistical Analysis: Quantitative results were expressed as mean ± SD. The statistical differences were analyzed by ANOVA analysis, factorial analysis and P-values < 0.05 were considered significant. Responses observed for each of the formulations (F1–F9) were simultaneously fitted to quadratic model using Design-Expert® Software Version 11.0.0. Fourier Transform Infrared Spectroscopy (FT- IR): FT-IR spectroscopy studies were performed to ensure that the processing time has not led to any interaction between the drug and polymer in the formulation. The FT-IR spectrum of the pure metronidazole, sodium alginate, and carbopol 934P were shown in Fig. 1 - 3. Furthermore, the spectrum of carbopol 934P-sodium alginate mucoadhesive microcapsules containing metronidazole was shown in Fig. 4. It was recorded on Shimadzu's Fourier transform infrared spectrometer (Japan) with a frequency range of 4000-450 cm-1. The sample of pure metronidazole showed feature vibrations peaks for O-H, C-H and C=O stretching frequency at 3209.36 cm-1, 3100.14 cm-1, and 1739.19 cm-1, respectively. The peaks at around 1471.91 cm-1 and 1354 cm-1 were attributed to symmetric and asymmetric stretching N=O, respectively. The band peaks at 1427.33 cm-1, 1264.51-1185.80 cm-1, and 1073.40 cm-1 were assigned to C-C stretching, C-O stretching, and C-N stretching, respectively. The FTIR spectrum of sodium alginate showed peaks at about 3228.00 cm-1, 1595.00 cm-1, 1406.95 cm-1, and 1024.32 cm-1 that were indicating of O-H stretching vibrations, COO- stretching vibrations, -CH stretching vibrations and C-O-C stretching vibrations, respectively. The vibration peaks of polymer HPMC K15M at 3370.25 cm-1 and 2932.10 cm-1, which were due to O-H stretching and C-H stretching, respectively, as well as the presence of peaks at around 1427.96 cm-1, 1369.11 cm-1, 1187.38 cm-1, 1054.91 cm-1 and 946.99 cm-1 were assured to –CH2 symmetric bending vibrations, -CH3 asymmetric bending vibrations, C-O stretching vibrations, C-O-C stretching vibrations and pyranose ring, respectively. Finally, the FT-IR spectrum for HPMC K15M- sodium alginate mucoadhesive microcapsules containing metronidazole showed different absorption characteristics of peaks of metronidazole, sodium alginate and HPMC K15M were found that the almost same primary peaks were also present in the drug-polymer combinations, indicating there is no interaction between polymer and drug used as shown in Fig. 4. Particle Size Measurement of Metronidazole Mucoadhesive Microcapsules: The particle size within the range of mucoadhesive microcapsules of metronidazole was found to be 760.08 ± 0.04 (μm) to 852.46 ± 0.04 (μm), respectively. Researchers have suggested that as polymer concentration increased, the particle size also improved, which could be due to enhancing in the viscosity of drug and polymer ratio, and coat thickness of polymer 38, 39. The present study indicated that the higher concentration of sodium alginate and HPMC K15M solution form large droplets with increased particle size than those of lower concentration polymers result in small droplets and diminish particle size due to the difference of viscosity, as shown in Table 3. Lower polymer concentration resulted in decrease in inner phase viscosity, which might efficiently promote the break-up of coacervate droplets and prevent coalescence. The smallest particle size was produced when sodium alginate, carbopol 934P was used at a low-level concentration. The highest particle size was achieved when polymer concentration was acquired higher level. Increased in sodium alginate concentration resulted in increased in particle size and this observation is found to be in the line of previous research reported 40. Percentage Yield of Metronidazole Muco-adhesive Microcapsules: The Percentage yield of metronidazole mucoadhesive microcapsules were found to be within the range of 92.48 ± 0.04% to 93.16 ± 0.02% for metronidazole-HPMC K15M mucoadhesive microcapsules, respectively. The present study found that the percentage yield was increased when the polymer ratio was increased as well. The studies have proved that the percentage yield of mucoadhesive microcapsules was improved within increasing the concentration of sodium alginate also 41. Other studies have reported that the percentage yield decreased, with an increase in sodium alginate due to the high viscosity of the drug-polymer solution, needle blockage wastage of the drug-polymer solution, loss transferring and washing 42. Drug Entrapment Efficiency of Metronidazole Mucoadhesive Microcapsules: The entrapment efficiency is a vital parameter that assists in the identification of drug efficacy, and it depends on various concentrations of mucoadhesive polymers such as sodium alginate and HPMC K15M. The average efficiency ranges for metronidazole-HPMC K15M mucoadhesive microcapsules was 85.16 ± 0.01% to 92.07 ± 0.02% respectively, as shown in Table 3. Present work found that some formulation of metronidazole mucoadhesive microcapsules has lower entrapment efficiency due to decrease number of binding sites of alginate for Ca2+ ions consequently formulations are less compact gel membrane which, in turn, the superior influx of Ca2+ ions leading to decrease in drug entrapment efficiency and also lower polymer concentration. Metronidazole mucoadhesive microcapsules have highest entrapment efficiency due to increase polymer concentration especially with higher sodium alginate concentration which provides increase number of binding sites of sodium alginate with calcium chloride. The result shows that the entrapment efficiency of mucoadhesive micro-capsules was increased with increased polymer concentration; the result was similar to previous studies 43, 44, 45. Swelling Index of Metronidazole Mucoadhesive Microcapsules: The swelling index of metronidazole- HPMC K15M mucoadhesive microcapsules was found to be a range of 85.88 ± 0.03% to 99.25 ± 0.02%. The swelling index of all the formulations was reported to be improved with the increased concentration of polymers as shown in Table 3. The result shows that maximum swelling index was achieved in increasing polymer concentration; which was similar to the study as reported previous literature 46. Mucoadhesion Testing by in-vitro Wash-off Test: The study of in-vitro bioadhesion demonstrated that metronidazole-HPMC K15M mucoadhesive microcapsules had good bioadhesive property ranging of 49 ± 0.01% to 69.00 ± 0.04% respectively, as shown in Table 3. The present study was carried out for a higher level of polymer concentration by factorial metronidazole muco-adhesive microcapsules formulations F9 was excellent mucoadhesion and strongly adhered to the gastric mucous layer. 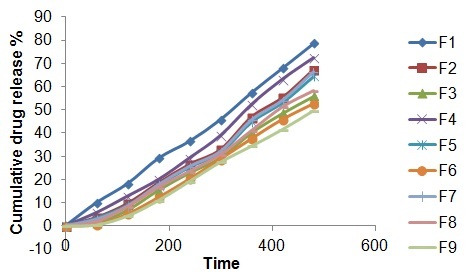 The results were observed that if the drug and polymer concentration was improved; the percentage of mucoadhesion was also increased, as shown in Fig. 5. It was observed that mucoadhesion of metronidazole mucoadhesive microcapsules significantly increased with increasing polymer concentration due to increase in viscosity and produced stronger mucus gel network which helps to enhance mucoadhesion. In-vitro Dissolution Studies of Metronidazole Mucoadhesive Microcapsules: The present study showed that metronidazole mucoadhesive microcapsules in most of the formulations were negligible amounts of drug release in simulated gastric fluid (0.1N HCl, pH 1.2); whereas for those formulations were increased amount of drug release in simulated intestinal fluid (pH 7.4), as shown in Fig. 6. It was found that the percentage of cumulative drug release (CDR %) in the range of 78.71 ± 0.02% to 49.70 ± 0.01%, respectively. It was observed that metronidazole- HPMC K15M mucoadhesive microcapsules formulation F9 has slower drug release rates due to higher polymer concentration. The results showed that the drug release was decreased when the polymer concentration was improved attributed to high viscosity of polymer and drug solution The result was observed that the mucoadhesive microcapsules was slow and spread over an extended period of time when sodium alginate concentration was increased that was similarly reported by previous studies 47, 48, 49. Drug Release Kinetic Profile: Metronidazole-HPMC K15M mucoadhesive microcapsules F9 was selected as the most potential for its drug release kinetics model like zero order, first order, Higuchi and Korsmeyer-Peppas models. The R2 of these models were determined and compared. The result of the curve fitting into various mathematical models was shown in Table 4 and Fig. 7 - 10. The suitability of the model has been observed by best fit to the model using the correlation co-efficient value (R2). The data obtained from analysis of drug release kinetics were shown in Table 4. The zero order, first order, Higuchi and Korsmeyer-Peppas models were shown in Fig. 7, 8, 9 and 10. From the results shown in Table 4, it can be observed that the release kinetics of metronidazole mucoadhesive microcapsules from the different formulations showed good fitting with zero order, first order and Higuchi model with R2 values 0.977, 0.955 and 0.814 respectively. On the other hand, the model with the highest correlation coefficients (R2) was given by zero order. The n value of Peppas model (0.68) indicates that the mechanism of drug release followed by non-Fickian diffusion. This suggests that drug release occurs mainly by diffusion through polymer matrix from a region of high concentration to lower concentration. Statistical Analysis: Metronidazole mucoadhesive microcapsules were used to derive a statistical equation, ANOVA analysis, contour plots, and 3D response surface plots. Statistical analysis was analyzed according to Table 3. Factorial Equation: The result of equation Y that are indicated particle size, drug entrapment efficiency, swelling index, mucoadhesion and drug release for all batches (F1-F9) showed a wide variation of independent and dependent variables. The factorial equation for particle size (Equation 1), drug entrapment efficiency (Equation 2), swelling index (Equation 3), mucoadhesion (Equation 4), and drug release (Equation 5) in metronidazole mucoadhesive microcapsules HPMC K15M were shown in Equation 1, 2, 3, 4 and 5. A positive coefficient represents a synergistic effect, while a negative coefficient indicates an antagonistic effect. Metronidazole mucoadhesive microcapsules regression equation (1, 2, 3, 4 and 5) showed that positive sign X1 (sodium alginate) and X2 (HPMC K15M) illustrates synergistic effect, and indicates that if polymer concentration increases; the value of depended variables (particle size, entrapment efficiency, swelling index, mucoadhesion, and drug release) is also increases. Negative effects of X12 and X22 suggest that as the total amount of polymer increases, all depended on variables increases slowly. Positive effects of X12 and X22 suggest that as the total amount of polymer increases, all depended variables increases significantly. Two independent variables of sodium alginate X1 had a lower value of co-efficient than HPMC K15M X2 co-efficient value for metronidazole muco-adhesive microcapsules which indicated that X2 had a prominent effect on Y. Contrary, sodium alginate X1 had a higher value of co-efficient than carbopol 934P X2 coefficient value for metronidazole mucoadhesive microcapsules which implies that X1 showed much-pronounced effect Y.
Factorial Design of ANOVA Analysis, 3D Response Surface and Two- Dimensional Contour Plots for Metronidazole Mucoadhesive Microcapsules: ANOVA analysis was used to response combination formulations and it is also used to identify the formulations significant or insignificant. On other hands, three-dimensional response surface plots were generated for every response to study the performance of the manner and also assisted the main and interaction effects of the independent variables (factors), as well as two-dimensional contour plot provides a visual representation of values of the response. Table 5 is seen that sodium alginate and HPMC K15M value less than 0.0500 which are achieved statistically significant. Metronidazole muco-adhesive microcapsules were prepared using both polymers and models were observed significantly. The contour plot Fig. 11A - 14A and response surface plot Fig. 11B - 14 B indicates that when the sodium alginate (X1) and HPMC K15M (X2) concentration is gradually increased, the all depended variables (without drug release) is gradually improved, as well as sodium alginate (X1) and HPMC K15M (X2) concentration is enhances, drug release Fig. 15A and 15B is also decreases. CONCLUSION: The observations made during study and results obtained showed the suitability of the investigated polymers for microencapsulation of metronidazole for its sustained release. The ionic gelation method was easy to adopt and also to achieve high drug entrapment efficacy. The result observed that metronidazole mucoadhesive microcapsules of entrapment efficiency, percentage release, particle size, and drug release behavior varies with increased drug-polymer concentration. Additionally, the microencapsulated forms of metronidazole are also anticipated to have enhanced oral bioavailability, minimized harmful side effects and reduced dosing frequency which would be further helpful to improve patient compliance. The in-vitro drug release studies demonstrated that the drug release was sustained about 14 h and non-fickian controlled release mechanism of metronidazole mucoadhesive microcapsules. The results of 32 factorial designs revealed that drug and polymer concentration significantly affected dependent variables entrapment efficiency, percentage release, particle size swelling index, mucoadhesion, and drug release. The metronidazole mucoadhesive microcapsules of the best formulation F9 exhibited high entrapment efficiency, the percentage of mucoadhesion and sustain in gastric mucosa. Therefore, one can assume that metronidazole mucoadhesive micro-capsules are promising pharmaceutical forms by providing controlled-release drug delivery systems. ACKNOWLEDGEMENT: BP designed the concept and drafted the manuscript. SA and MJQ reviewed the work and also contributed in the writing of the final version of the manuscript. All authors read and approved the final manuscript. Garud A and Garud N: Preparation and evaluation of chitosan microcapsules of metronidazole using tripolyphosphate cross-linking method. Dhaka Univ J Pharm Sci 2010; 9(2): 125-130. Szekalska M, Winnicka K, Czajkowska-Koanik A, Sosnowska K and Amelian A: Evaluation of alginate microspheres with metronidazole obtained by the spray drying technique. Acta Polon Pharm Dru Res 2015; 72(3): 569-578. Amin MD, Ahmed T and Mannan MA: Development of floating-mucoadhesive microsphere for site-specific release of metronidazole. Adv Pharm Bull 2016; 6(2): 195-200. Lofmark S, Edlund C and Nord CE: Metronidazole is still the drug of choice for treatment of anaerobic infections. Cli Infect Dis 2010; 50: 16-23. Kumar MP, Ishaq BM, Reddy RK, Kumar RP, Badrinath AC and Chetty CM: Formulation and evaluation of colon specific matrix and coated tablet of metronidazole. Int Res J Pharm 2011; 2(9): 194-199. Arora S, Gaura B and Budhiraja RD: Mucoadhesive and muco-penetrating delivery systems for eradication of Helicobacter pylori. Asian J Pharm 2012; 2: 18-30. 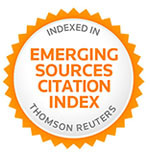 De Francesco V, Giorgio F, Hassan C, Manes G, Vannella L, Panella C, Ierardi E and Zullo A: Worldwide H. pylori antibiotic resistance, a systematic review. J Gastro Liv 2010; 19(4): 409-414. Caliskan, Tokman, Erzin R, Saribas HB, Yuksel Y, Bolek S, Sevuk P, Demirci BK, Yilmazli EO, Akgul MO, Kalayci O, Cakan F, Salih H, Bal BK and Kocazeybek B: Antimicrobial resistance of Helicobacter pylori strains to five antibiotics, including levofloxacin in Northwestern turkey. Revistadasocie Brasileira Med Trop 2015; 48(3): 278-284. Filipa F, Monica V, Roxo R and Mónica O: Helicobacter pylori resistance to antibiotics science against microbial pathogens. Com Cur Res Tec Adv 2011; 745-756. David YG, Lee YC and Wu MS: Rational pylori therapy: evidence-based medicine rather than medicine-based evidence. Cli Gastro Hep 2014; 12: 177–186. Reddy KVR, Nagabhushanam MV and Naik ER: Effect of drying techniques on drug release of cross linked alginate simvastatin beads by using hydrophilic polymer. Res J Pharm Biolo Chem Sci 2017: 8(3): 2015-2029. Kumar SH, Sunita L and Lila KN: Formulation and in-vitro evaluation of metformin hydrochloride loaded microspheres prepared with polysaccharide extracted from natural sources. Acta Pharm 2013; 63: 209-222. Madhav NVS, Ojha A, Tyagi Y and Negi M: Mucoadhesion: A novelistic platform for drug delivery system. Int J Pharm Dru Ana 2014; 2(9): 773-781. Arshad BK, Rajat M and Emili P: Review on mucoadhesive drug delivery system: novel approaches in the modern R. J. Pharm. Sci 2014; 4(4): 128-140. Arica B, Alis SC, Iilla PA, Durlu NT, Akar NC, Kas HS and Hinca AA: In-vitro and in-vivo studies of ibuprofen-loaded biodegradable alginate beads. J Microencapsu 2005; 22(2): 153-165. Fujiwara GM, Campos R, Costa CK, Dias JDF, Miguel OG, Miguel, MD, Marques FDS and Zanin SMW: Production and characterization of alginate-starch-chitosan microparticles containing stigmasterol through the external ionic gelation technique. Brazi J Pharm Sci 2013; 49(3): 538-546. Neha S and Harikumar SL: Polymers for Colon Targeted Drug Delivery: A Review. Int J Dru Develop Re 2013; 5(1): 21- 31. Abraham S, Madhu CD and Rajasekaran A: Preparation, evaluation and in-vitro characterization of biopolymer derived hybrid microcapsules for extended release of cefaclor. Int J Chem Pharm Sci 2014; 5(2): 145-155. Ghosh S, Majumder S, Pal R, Chakraborty M, Biswas A and Gupta BK: Formulation and evaluation of hydroxyzine hydrochloride sustained release microspheres by ionotropic gelation technique using Carbopol 934P. Asi J Pharm 2014; 8: 230-6. Mishra R, Agnihotri N, Goda C and Arora M: Micro-encapsulation - A Novel Approach in Drug Delivery: A Review. Indo Glob J Pharm Sci 2012; 2(1): 1-20. Dubey R, Shami TC and Rao KUB: Microencapsulation Technology and Applications. Defense Sci Journ 2009; 59(1): 82-95. Kumar BP, Chandiran IS, Bhavya B and Sindhuri M: Microparticulate drug delivery system: a review. Ind J Pharm Sci Res 2011; l(1): 19-37. Prasad BSG, Gupta VRM, Devanna N and Jayasurya K: Microspheres as drug delivery system – a review. J Glob Trend Pharm Sci 2014; 5(3): 19611972. Hosmani AH, Kasture PV, Gonjari ID and Karmarkar AB: Study of formulation variables on properties of glipizide mucoadhesive microspheres by factorial design. DARU 2009; 17 (4): 236-242. Emara LH, Abdou AR, El-Ashmawy AA and Mursi NM: Preparation and evaluation of metronidazole sustained release floating tablets. Int J Pharm Pharm Sci 2014; 6(9): 199-204. Shastri DH, Dodiya HD, Shelat P and Bhanu Priya AK: Formulation development and evaluation of a gastroretentive in-situ oral gel of cefuroxime axetil. J Young Pharmacists 2016; 8(4): 324-329. Shankar, Hardenia S, Jain A, Ritesh P and Anu KA: Formulation and evaluation of mucoadhesive microspheres of ciprofloxacin. J Adv Pharm Educ Res 2011; 1(4): 214-224. Yadav AV, Shete AS, Dabake AP, Shinde VR: Formulation and in-vitro evaluation of Aceclofenac microcapsules. Int J Pharm Techn Res 2009; 1:135-138. Shwetha S, Kamath K and Senthil SK: Design and evaluation of floating microspheres of Rabeprazole sodium. Int J Pharm Sci 2012; 4(3): 357- 367. Jain SK, Nitin KJ, Gupta Y, Jain A, Jain D and Chaurasia M: Mucoadhesive chitosan microspheres for non-invasive and improved nasal delivery of insulin. Ind J Pharm Sci 2007; 69: 498-504. Nagda CD, Chotai NP, Patel SB, Soni TJ and Patel ULN: Preparation and in-vitro evaluation of bioadhesiv emicroparticulate systems. Int J Pharm Sci nanotechno 2008; 1: 275-266. Nimisha BM and Bhattacharya A: Formulation and evaluation of bioadhesive microcapsules of tizanidine hydrochloride for nasal drug delivery. Ind Pharmacist 2008; 7: 71-77. Stephen RB, Rajveer CH, Sudharshini S and Kishore RA: Preparation and evaluation of mucoadhesive micro-capsules of Nimodipine. 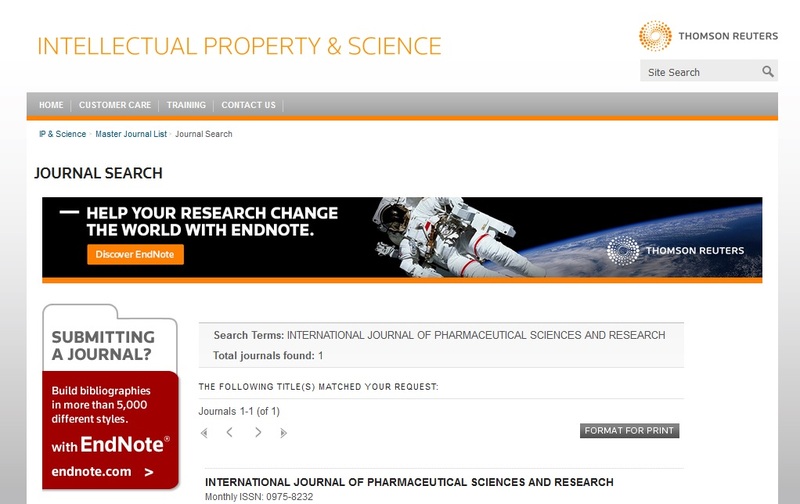 Int J Res Pharm 2010; 1: 219-224. Jiménez MRC, Zia H and Rhodes CT: Design and testing in-vitro of a bioadhesive and floating drug delivery system for the oral Int J Pharm 1994; 105: 65-70. Badhan AC, Mashru RC, Shah PP, Thakkar AR and Dobaria NB: Development and evaluation of sustained release gastro-retentive minimatrices for effective treatment of pylori infection. AAPS Pharm Sci Tech 2009; 10: 459-467. Nayak AK, Pal D, Pradhan J and Hasnani MS: Fenugreek seed mucilage - alginate composite beads of metformin HCl: Design, optimization and evaluation. Int J Bio Macromole 2013; 54: 144-154. Ardenia A and Gupta AK: Development and optimization of gastroretentive mucoadhesive microspheres using 33 factorial design. Int J Pharm Sci Res 2016; 7(5): 2020-2030. Chandra GI, Satyabrata B, Ellaiah P, Martha SK, Sahu PK, Tiwari SP, Panigrahi BB and Debajyoti D: Design and evaluation of acyclovir mucoadhesive microcapsule. Int J Pharm Sci Rev Res 2010; 5: 18-25. Swetha K, Vani V, Satyabrata B and Sudhakar M: Formulation and evaluation of mucoadhesive microspheres of irbesartan. J Adv Pharm Educa Res 2013; 4: 450-463. Thulasi VM and Sajeeth CI: Formulation and evaluation of sustained release sodium alginate microbeads of carvedilol. Int J Pharm Tech Res 2013; 5(2): 746-753. Altafbhai MS, Vandana Y and Prasanth VV: Formulation and evaluation of mucoadhesive microspheres of metformin hydrochloride. Ind J Pharm Sci Res 2014; 4(2): 94-101. Sathali AH and Varun J: Formulation, development and in-vitro evaluation of candesartan cilexetil mucoadhesive microbeads. Int J Curr Pharm Res 2012; 4(3): 109-118. Anuranjita K: Preparation and evaluation of sustained release microbeads of norfloxacin using sodium alginate. Int J Res Pharm Chem 2012; 2(3): 647-650. Shanthi PCH: Design and Characterization of mucoadhesive microspheres for gastro-retentive delivery of famotidine hydrochloride. J Bioeng Biomedi Sci 2015; 5(2): 2-6. Badarinath AV, Reddy JRK, Rao KM, Alagusundaram M, Gnanaprakash K and Chetty CMS: Formulation and characterization of alginate microbeads of flurbiprofen by ionotropic gelation technique. Int J ChemTech Res 2010; 2(1): 361-367. Atishkumar SM and Pund YP: Design and development of sustained release floating beads of metronidazole using natural polymer. IOSR J Pharm 2017; 1(1): 1-9. Rajesh M, Jaifar P, Helen SA, Asha C, Palanichamy S and Thanga TA: Formulation and evaluation of mucoadhesive microcapsules of aceclofenac. J Pharm Res 2012; 5: 1428-1431. Abass HA and Kamel R: Formulation and evaluation of in-situ forming polymeric drug delivery systems for mixed vaginal infection. British J Pharm Res 2014; 4: 2281-2295. Sriram N and Katakam P: Formulation and evaluation of mucoadhesive microspheres of pioglitazone hydrochloride prepared by ionotropic external gelation technique. J Encapsula. Adsorp Sci 2016; 6: 22-34. Paul B, Adimoolam S and Qureshi MJ: Formulation and in-vitro evaluation of metronidazole loaded HPMC K15M mucoadhesive microcapsules for H. pylori infection using 32- full factorial designs. Int J Pharm Sci & Res 2019; 10(2): 555-67. doi: 10.13040/IJPSR. 0975-8232.10(2).555-67. Authors Address: Department of Dosage Form Design, Faculty of Pharmacy, MAHSA University, Selangor, Malaysia.